It’s almost here: Tuesday, November 8 is Election Day. Get out to vote or turn in your mail ballot. Find your polling place online or call 800-345-VOTE. Need help researching the issues? Here are UPTE’s endorsements, the California Federation of Labor’s endorsements, and the progressive Courage Campaign and the non-partisan CalMatters guides. 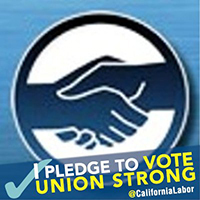 Spread the word about voting with the California Federation of Labor’s I pledge to vote Union Strong badge to your profile pics on social media. National election developments will, of course, be broadcast far and wide. Here are some publications you may find useful to check: the Guardian, the Washington Post, the Huffington Post and Politico. For California news, the San Francisco Chronicle and the Los Angeles Times have in-depth reporting. Remember: UC provides 2 hours off for voting, if needed, whether you are covered by a union contract or by personnel policy. Contact your local UPTE office if you have questions or need help. In many countries around the world, Election Day is a national holiday. Fortune reports that a growing number of private US employers – including GM, Ford, Patagonia, Spotify, Survey Monkey and Salon – are giving employees the entire day off to vote and do election work as part of a campaign called Take Off Election Day. Wouldn’t it be great if UC joined that campaign? For Bay Area readers: join fellow union members supporting the water protectors at Standing Rock, ND who will call on banks financing the Dakota Access Pipeline to pull their money out. Gather on Thursday, 11/10 from 3:30-5:30 pm at Wells Fargo, 1221 Broadway in Oakland.